In lieu of the fact that I was actually in Kenya after having read Ngugi wa Thiong’o’s Petals of Blood, I’ve decided to mix it up this time. 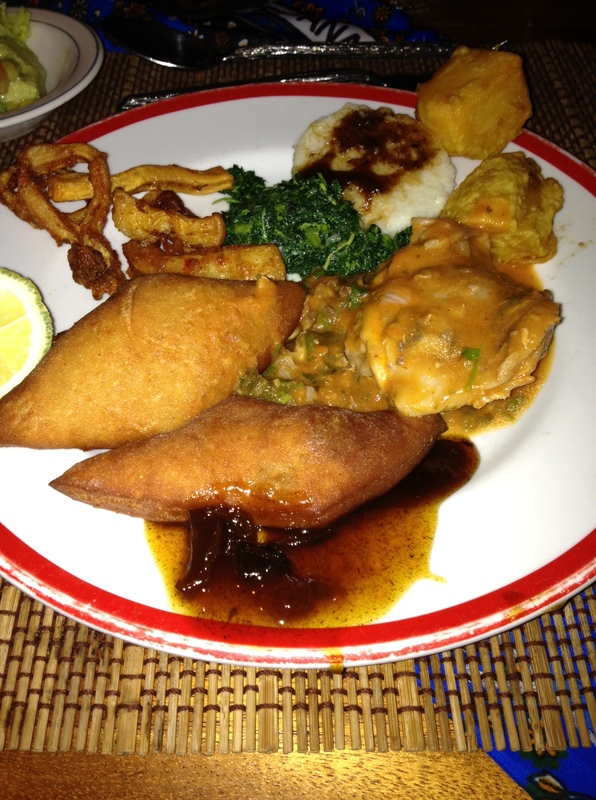 Instead of the usual food entry, I’m just going to talk a little about my experience in Kenya, and the food I had there. Let me just make one thing clear here, as I don’t know if I did so in the review part. 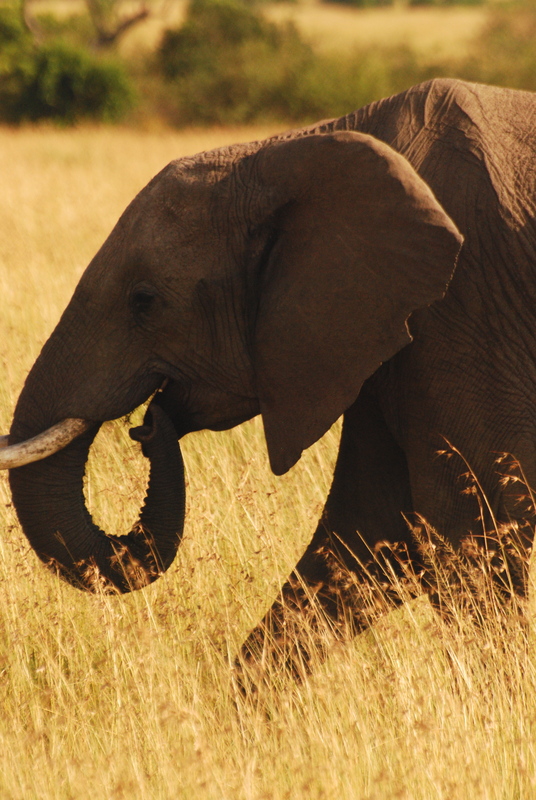 I am insanely grateful that I was given the chance to go to Kenya and Tanzania. I am also hyper-aware of the fact that the majority of the population of the world will never get that chance and that I was afforded a once in a lifetime opportunity to witness wild animals in their natural habitat. I do not in any way want to seem jaded or unappreciative. However, part of traveling is observing the world around you. Not just the pretty, heartwarming, jaw-dropping parts, but also the sad, ugly parts that you may wish weren’t there. 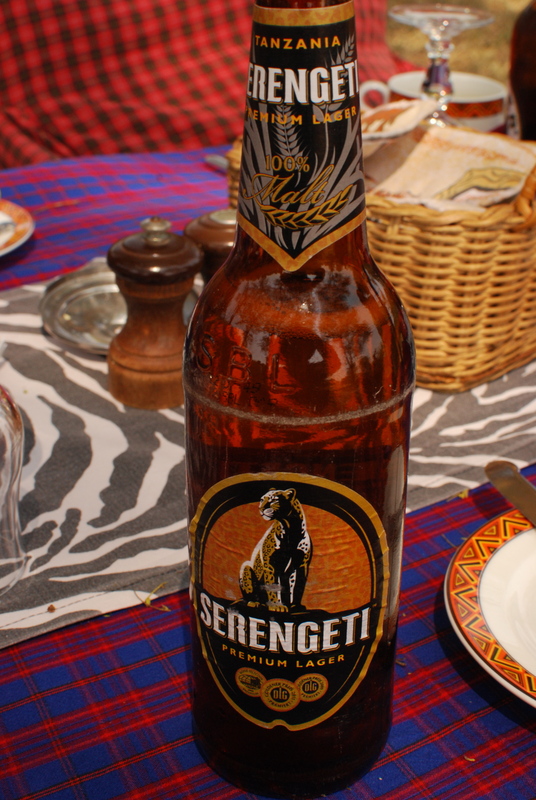 The fact that I may be critical about the tourist industry in Kenya doesn’t mean that I think it is wholly a bad thing. There is no black and white, bad or good. I am just being observant. Irio is the one in the front, which consists of mashed peas, corn, and potatoes, which is exactly what it tastes like. 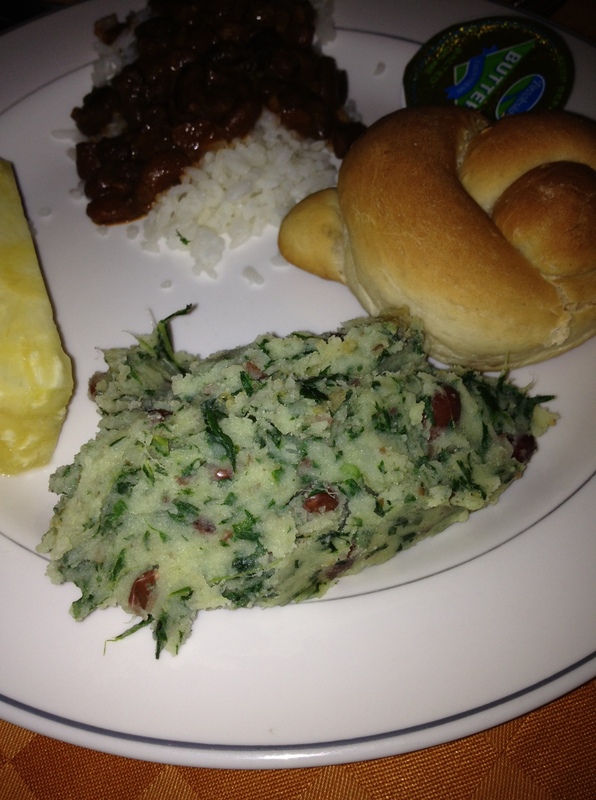 Ugali is the white cake-like thing in the back with gravy on it. I had so given up on finding any authentic food at these buffets that I stopped taking my camera. Of course, that’s when they turned up so I was forced to use an iPhone camera. Ugali is a dish made of maize flour cooked with water until it has a doughy consistency. It’s the most common starch staple in the Kenyan diet, and is usually eaten with gravy. It doesn’t have much taste on its own, which I guess is why gravy is necessary. The reason I grouped these together is because in Petals of Blood, when the police come to take Munira in for questioning they say, “Are you Mr Munira?….Ah, yes. We try to be very sure. Murder, after all, is not irio or ugali” (2), meaning, since these two foods are probably the most commonplace of all Kenyan cuisine, that murder in Ilmorog is no common thing. 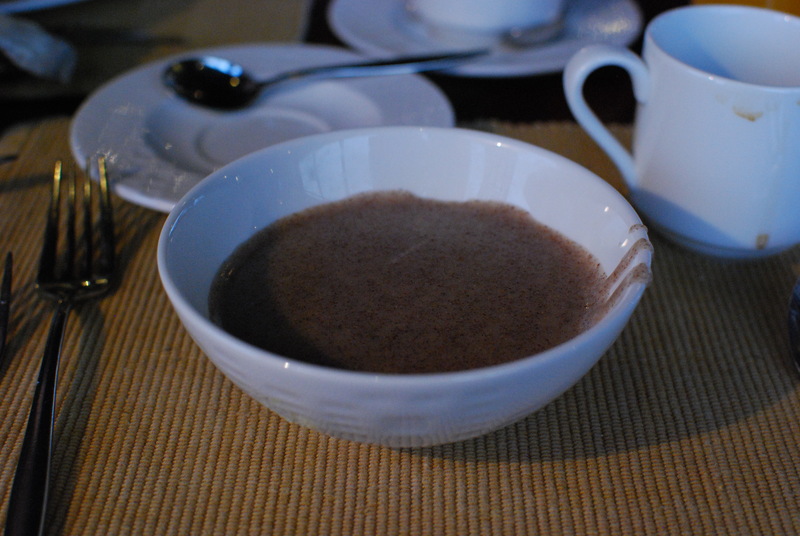 Millet is an essential grain in Kenya as shown in Petals of Blood, when, while drinking Theng’eta, a powerful semi-hallucinogenic homemade alcohol which, as far as I can tell, is purely fictional, the drinkers say “Millet, power of God!” This porridge tasted pretty much exactly the same as Cream of Wheat, which I happen to like. 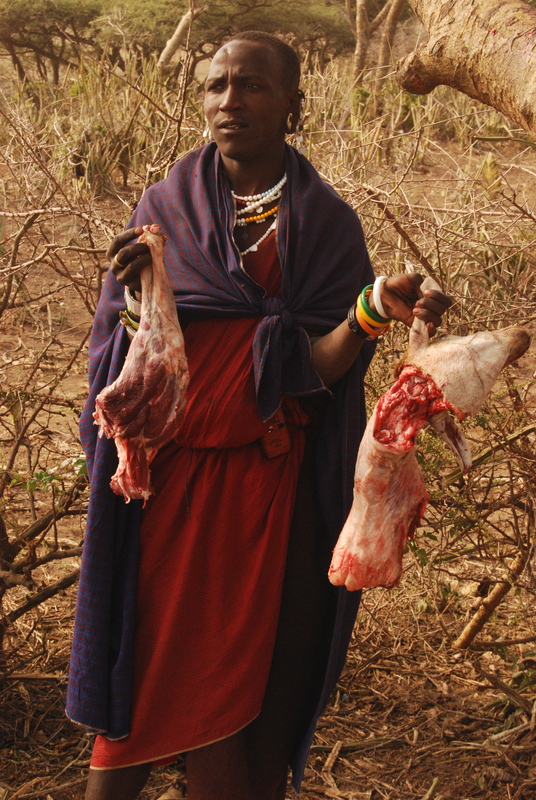 Goat meat is the most common meat among the Masai people, at least, and tastes similar to lamb, but with a stronger flavor. 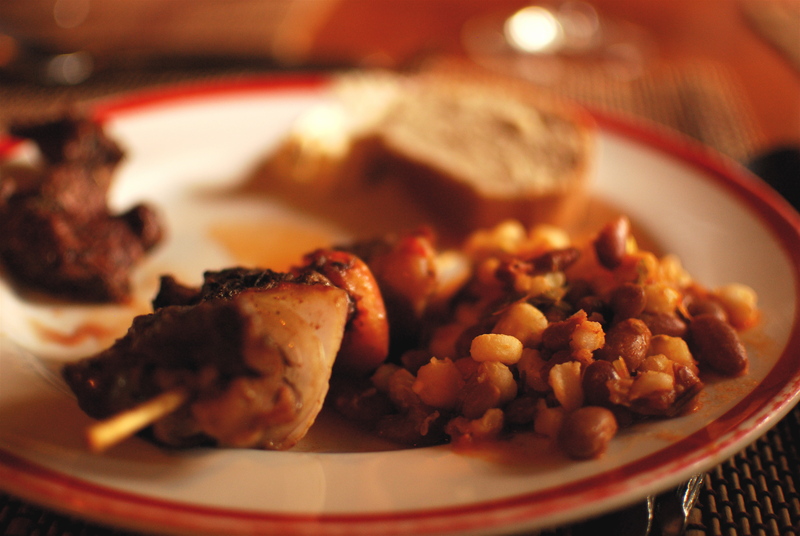 Githeri is simply a mix of maize and kidney beans. Yum, goat! This was taken in a small Masai village outside of the Ngorogoro Crater. 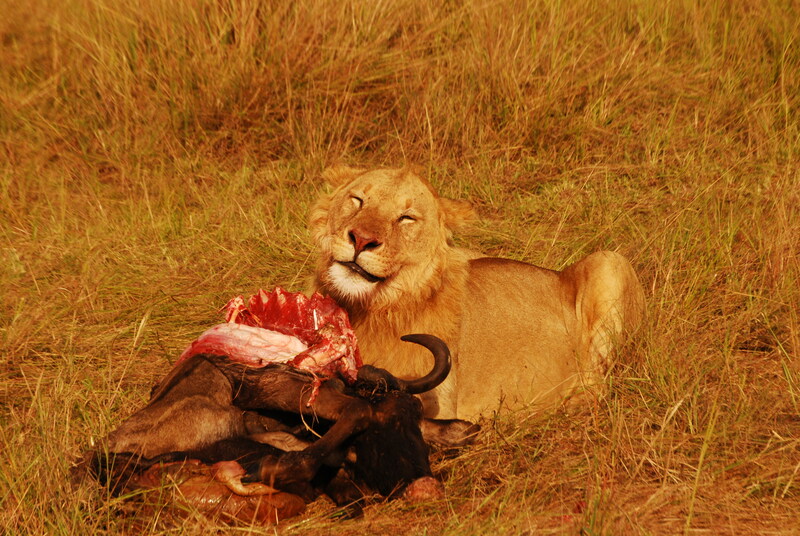 And that is the extent of what I was able to eat in Kenya. If you had asked me before my trip if I could ever possibly get sick of buffets, I would have laughed in your face. But after two straight weeks of exclusively five-course meals and buffets, I almost (note: almost) hope I never see another buffet again. 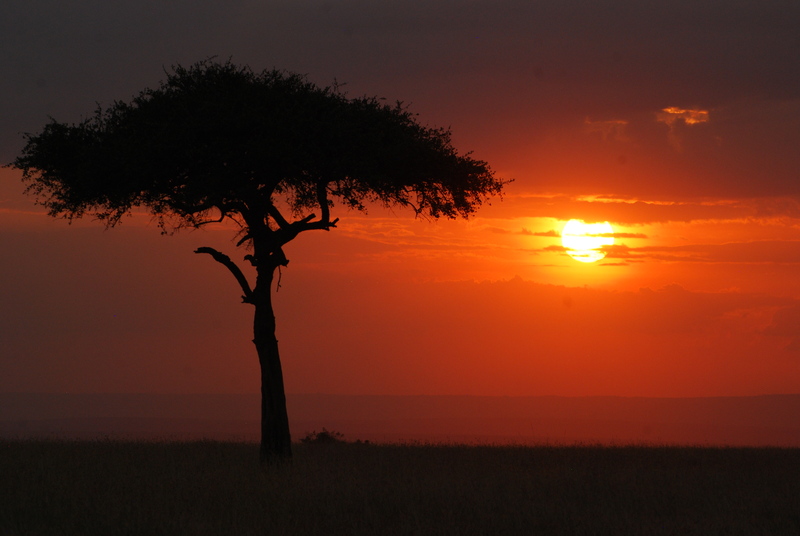 One day, I hope to be able to return to Kenya and travel around it in the way I like best: by meeting people, seeing how they actually live, eating authentic food, and simply observing their daily life. Watching it pass by outside the windows of my truck was not enough. Going to the one Masai village that we did go to, where they are paid to accept tourists, thereby taking away somewhat from the authenticity, was not enough. I want more. But for now, I will be content with the memories that I have of witnessing Nature in her truest form. I’ll close this entry by showing a few more pictures that I took that have something to do with the story. 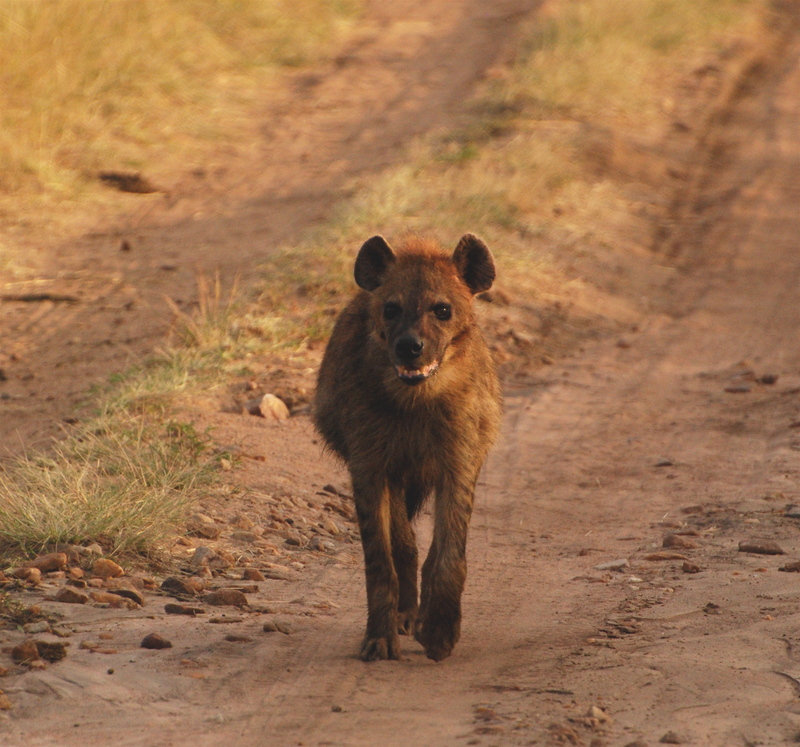 In Kenya, parents often warn their children that if they don’t behave, hyenas might come and carry them off. Look at those teeth…I’m pretty sure that would have scared me into obedience. 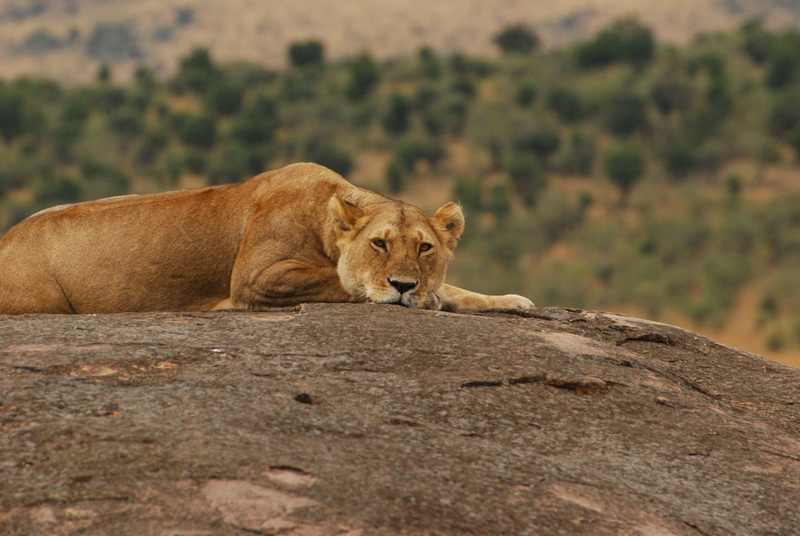 “I am lost…we are all lost…but she is… She must be… my wild-eyed lioness…. What was done was done… and it was for you, my moonlight lioness…” (251). And now we come to the end of what, for me at least, has been the most epic entry yet. I traveled to the other side of the world and back, and through it was able to understand a story in a more intense way than ever before. African literature is a canon that commonly gets passed over. I myself have only read one other book by an African author, Nervous Conditions by Tsitsi Dangarembga, which I will also cover one day in this blog. It’s a grievous oversight. So if you have never read any literature by a Kenyan author, or any African author, Petals of Blood is a good place to start. I promise you’ll be thinking about it long after you finish. Africa has a way of staying with you. Oh yea, and just remember… Eat or you are eaten! 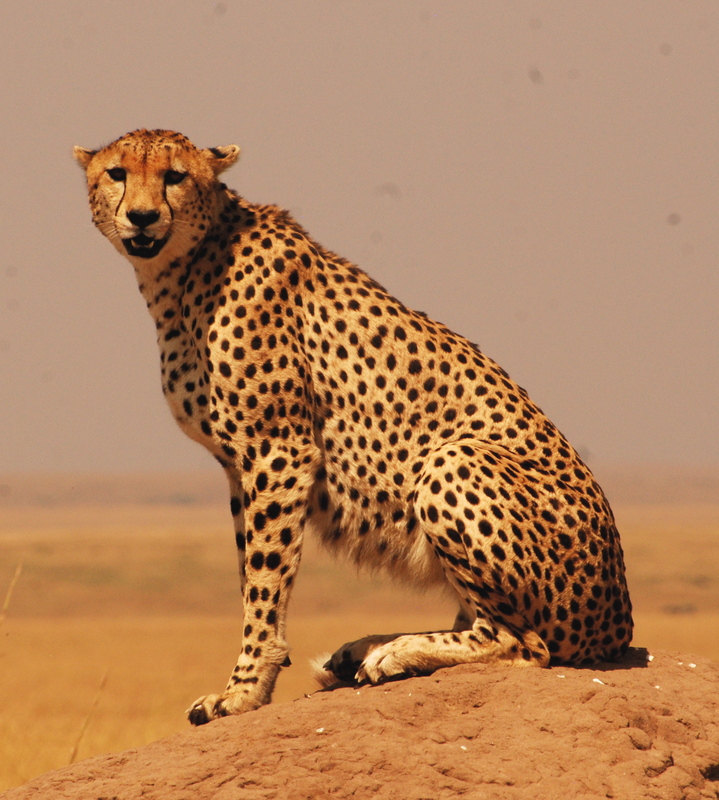 *All pictures taken in the Masai Mara game reserve, Kenya, unless otherwise noted. I was fortunate to work on a film in Kenya back in 1983. For eight weeks my mixed crew of Americans, Brits and Kikuyu lived and worked on the edge of Lake Amboseli (which last saw water in the Pleistocene era) and Amboseli National Park. For a period of 4 weeks we worked on a big scene which required we recruit over 60 of the local Maasai. There were occasional tense moments as the Masai and the Kikuyu, who we brought from Nairobi, were not on the best of terms with each other. We shot one scene at the house of the local head of the Maasai, Stanley Oloitiptip, and to this day I remember it vividly. The flies around this ranch (which wasn’t a picturesque wooden hut but looked just like a San Fernando Valley tract house) were something right out of a Biblical plague. They enveloped you, crawled on your face, up your nostrils, and probed at the corners of your eyes for food. The Maasai didn’t seem bothered by them, but I thought I would go mad before we left. Although flies were always around, they never were an issue anywhere else. The Maasai diet probably had a lot to do with the close relationship between the locals and the insects. Although I ate local food, I didn’t eat any meat during my entire stay and got my protein solely from hard-boiled eggs and nuts. 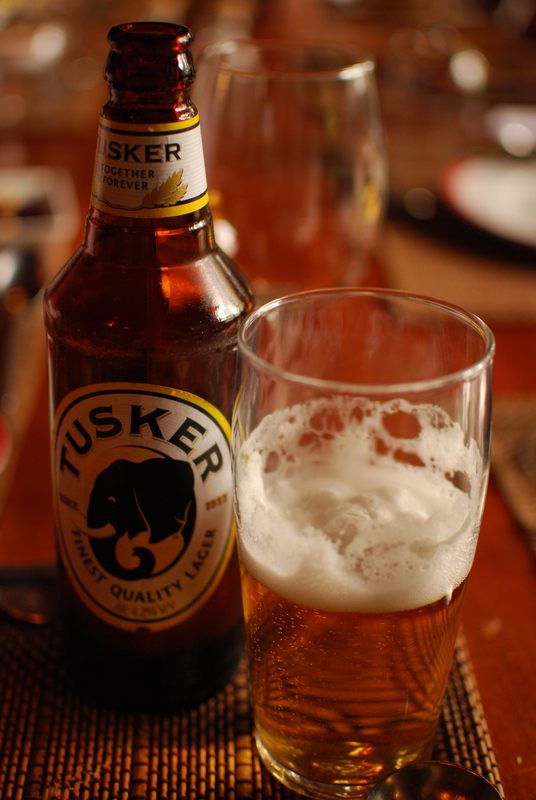 Since so many other crew members had dysentery from drinking water from the “water purifier”, I drank only Tusker (Tusker Premium is one of the world’s truly great beers) and White Cap beer, Gordon’s gin, brought by one of the Brits, and Coca-Cola. Despite losing 20 pounds during the 8 weeks I was in Kenya, I never felt healthier (living out in the open really does have remarkable benefits, as long as the weather is good). The black Kenyans (as opposed to those Kenyans who came from India during colonial days and stayed on after independence), were usually affable, but do not have the same concern over schedules that westerners have, and this can drive you crazy. Although I spent most of my time in the back country, my occasional trips to Nairobi were depressing due to the poverty and the great numbers of mendicants, a shocking proportion of them twisted and crippled by polio. I pray that this disease has been eradicated by now. I would rate this experience as the best I ever had in a foreign country, and have often thought of going back.